1st, 2nd and 3rd place getters in each category receive a medal as well as a prize from one of our Series sponsors. 1st, 2nd and 3rd place in each category for the Active Feet Fun Tri races will receive a medal as well as a prize from one of our Series sponsors. We welcome all to enter the Series championship. 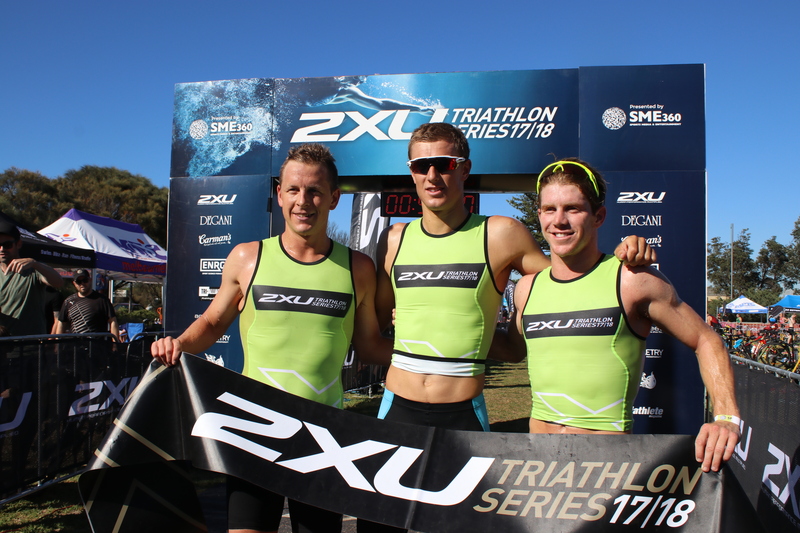 Participants are automatically entered upon registering in a 2XU Series race. Points can be scored by finishing top 10 in the Sprint Distances in Races 1 – 5, and the Olympic Distance in Race 6, in Elite, Junior Elite, Age Group & Clydesdale/Athena categories. These categories are the only championship categories for the series. To win your category you must have competed in a minimum of three championship races. If you compete in all races your best four scores will determine your final position. In the spirit of participation, if an athlete competes in either Olympic distance in Race 2 or 3, or Sprint distance in Race 6, in a championship category, zero points will be awarded for that race but the competitor will be deemed to have competed in a series race (assisting meeting the minimum requirement of racing in 3 events to be eligable to win). Competitors must ensure you enter the same category with each registration to accumulate series points. Competitors are only eligible to win in one category. Should a tie occur, a count back will determine placings where the participant with the highest number of wins shall be deemed the higher placing, with the Race 6 Olympic distance receiving a 110% weighting. Subsequent finishing positions will be used in order to break a tie should it not be broken on series wins. The table below summarises the points available. The 2018/19 SME360 Tri Club Competition is certain to provide plenty of exciting racing between Victoria’s triathlon clubs and squads. To ensure you are earning points for your club please select your Tri Club Name in the ‘Tri Club Name’ field when entering the event. If this needs to be changed after you have registered, please edit your registration through the registration confirmation email. No further club changes to registrations will be made after the start of each race, except for Race 6 where the deadline will be Saturday 2pm before the event. In the spirit of participation, one point is allocated to each club member competing in either a Triathlon (both Olympic and Sprint distances) or a Fun Tri. Those who finish within the top five of their category (excluding Family & Friends) will also be awarded additional points to go towards their Tri Club tally. The best 15 competitor’s club points are summed to calculate the club’s point score for a particular race. Final places are determined by aggregate points scored over all six races. To be eligible for this competition, competitors must be a student at an Australian University, or primary or secondary school. The same method of calculation from the Tri Club Championship applies for the 2018/19 SME360 School Competition. No further points adjustments will be considered after the start of each event. For more information on the Gatorade Triathlon Series please call (03) 9595 3000 or send us a message using this form. Be up to date with all the latest event news, giveaways and much more.